From Key to Shining Key! Also known as Key West and the Florida Keys, the Conch Republic, like many nations was born from trouble. The trouble started back in the dark days of March 1982, when the U.S. Federal Government placed a Border Patrol Roadblock at the Last Chance Saloon in Florida City. On April 23rd, the Conch Republic flag was raised over city hall and the Schooner Western Union, under command of Captain John Kraus, went forth into the harbor and attacked the US Coast Guard Cutter DILIGENCE with water balloons, Conch fritters and stale Cuban bread. The DILIGENCE fought back with fire hoses and thus commenced the Great Battle of the Conch Republic. Prime Minister Wardlow surrendered and demanded foreign aid from the United States (which we are still waiting for!) 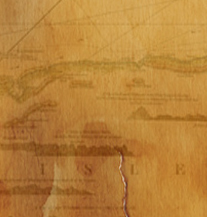 The road block was quietly removed and the glorious Conch Republic was born. This was not an act of revolution against the United States of America. It was a protest against the folly of zealotry resulting in the people of the Florida Keys being literally alienated as Americans. 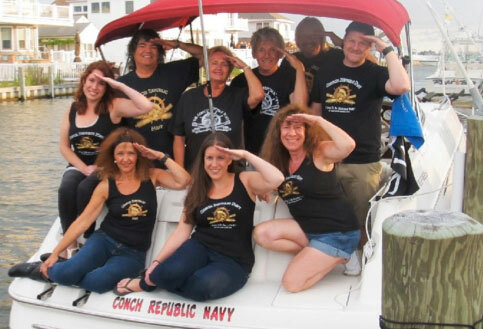 The Conch Republic Navy is always seeking able bodied Men, Women & Children. Learn more and join today! We Want You! 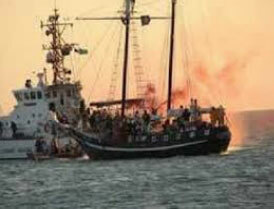 Official End of America's Hurricane Season Burning of the Flags Ceremony & CRMF Salute to the USCG! Join the Conch Republic Military Forces High Command and say good bye to the 2014 Hurricane Season.